This week's featured guest is writer/director/other??? Christian O'Neil. A.) 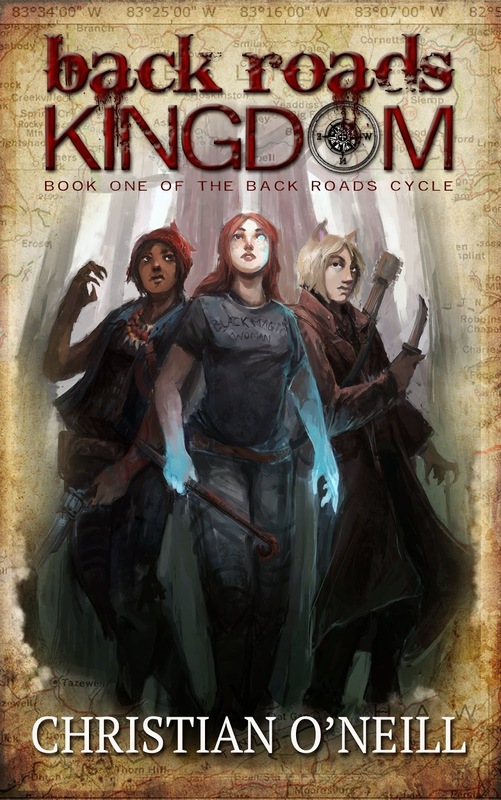 When I finally buckled down and wrote the first chapter of BACK ROADS KINGDOM, I was a wee lad of thirty-seven, bright-eyed and bushy-tailed and ready to take on the world. Prior to that, I'd written plays and screenplays, but never a novel. My wife's aunt, a mega-successful e-publishing romance novelist, asked me to co-author a romance/sci-fi hybrid with her. That project never really got off the ground, but it reminded me that writing was something that I loved doing and that it was time I finally made good on all the promises I'd made over the years and write my fantasy opus. I knew I had it in me, it was just a matter of forcing myself to turn off the TV and get it done. A.) When you aren't in the rhythm of it, it's about finding the self-discipline to do it. When the project takes hold of you, it's the exact opposite - EVERYTHING else in the world suddenly becomes a distraction, because writing is all you want to do. That's a wonderful, joyous place to be, just cruising along like that for months on end, seized by the story...but it can be hard to get from zero to sixty. (Translation: I'm a lazy procrastinator). A.) My brain was confused by the idea that I could no longer revise the manuscript, because that's all I've done for the last two years. Then I felt grief, then anger, then bargaining, and finally acceptance. Now I'm just hoping people find me! A.) My theater training has taught me that the two are inextricably linked. I would go so far as to say that character IS story. Another way of saying it is: story is what happens when characters have needs, and act on them. The only story anyone has ever been interested in hearing is, "The Story of the Character who Needed the Thing." I think a lot of people confuse story and plot, and a lot of writers stress over plot, but the plot will always write itself if the characters are active and drive the story forward. Plot is the organic way the world reacts to the character's struggle: the fallout, the complications, the resistance. A.) You want to know what a typical day looks like? Try surviving one, and then tell me how it went. First, you have to sleep lightly, in case a swarm of skeeters comes upon you in the night. A swarm that size will leave you a bloodless husk within thirty seconds. First thing to do upon waking is to ensure that the Belled Buzzard is nowhere about, because if so, you might want to call out sick: chances are a massacre is in the works. If you do get out, just be sure you're ready to duck and cover at the sound of motorcycle engines: rumor has it the Pale Riders are looking for slaves to bring to market. Such is the ugly truth of the world: up here in the Yonder, you're either predator or you're prey. But hey, at least you don't gotta pay Uncle Sam no dues, and it's been years since you had to befoul your eyes with the sight of an OfficeMax.